Discussion in 'Reviews , Video Reviews and Open Book' started by Ronaldo, Oct 20, 2018. This is the scaled down 54mm version of the new release 90mm . The figure is superbly sculpted and very elegant in pose and stature . There has been a lot of thought put into this figure re how it all fits together with some very precise locating pegs " some other manufactures could learn from this"
The only quible I have is the right hand does not fit as precise as it should ; but I think this will be an easy fix . According to the quality control coupon supplied this is no 2 casting , this is a good idea as you can send this back with any complaints . On to the figure then. Overall there is very little flash and mould lines to be addressed. The rider is in three main parts and is a superb fit ,again all locating pins make it easy to put together. Horse furniture is all cast well but will require some careful fitting and a bit of thought as to whether pre paint or in situ " no different than any other mounted figure"
Now re scale : it is certainly smaller than a Metal models mounted , I have no idea which is the closest to correct and will not hazard a guess. I am going to do a follow on SBS of the construction and painting of this piece from base , ground work and painting. Here are some pics of the model . Helm, oldtrousers, Ingvarr B and 2 others like this. Good review , but more photos please ! 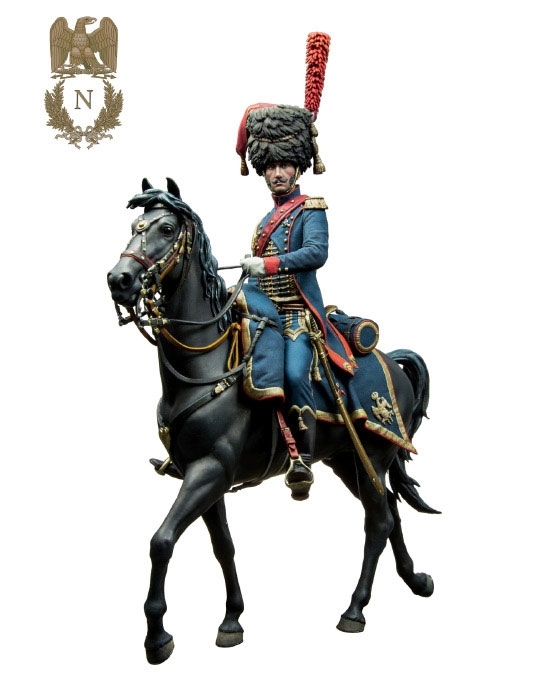 The figurine and especially the uniform worn, does not exist in the MM catalog, but a combination with some spare parts (MM sell almost all spare parts except the bodies and horses), so what is your opinion on the subject? And the shade of blue. What Andrea offer is a different style of figure , and yea it is a bit expensive for a 54 mm mounted ,. They also offer this in a 75 mm version on special request . So three options . 54, 75 and 90 mm . thats got to be good for the hobby . JonH and MCPWilk like this. Thanks for the review. The schabraque looks impressively crisp while the horse is rather common (especially the legs). Andrea does not seem to use the best alloys. This said the 90mm version might be more interesting. You are right Paul in what you say , and it is a costly 54mm coming in at almost £80. 00 inc Postage . The horse legs are probably in scale with the rest of the figure , Its just a different style than metal Models which you and I are both used too . Thank you for sharing this. It's really helpful to see the quality of the casting and to better understand what a buyer is getting for the price. The quality doesn't seem to be significantly better than that from the other high-end manufacturers and that's a surprise to me given the price. It's still a lovely model and it will be interesting to see the 90mm version. You are right Rodrigo , when it comes to 54 mm Napolionics , Metal models are at the top of the tree with casting , metallurgy and engraving . But this is still a nice offering and the pose is superb.